Many east coast transplants living in California share the same complaint. Since moving from New York to California six years ago, I’ve happily traded in chilly Octobers for perfect beach weather, humid Augusts for perfect beach weather, and frigid Februarys for … you guessed it, perfect beach weather. I find it difficult to miss anything about east coast weather when, almost every day of the year, I can eat lunch sitting outside in the sunshine, or walk my dog on the beach wearing a tank top. As a professional cook, I am perfectly content to watch the seasons change in my kitchen, versus in the outside temperature. While Californians miss out on weather variety, we overachieve in our seasonal food variety. A stroll to our local farmers market in Carmel this week revealed the presence of spring: Bright green bunches of asparagus, radishes every color of the rainbow, and leafy greens in every shape and size. My husband George and I would love to be those people who only shop for our food at the farmers market, but higher prices mean that we do have to supplement with trips to the grocery store. We like to walk to our Thursday market with just a $20 bill and spend that sparingly as we peruse the stalls. When you’re cooking for two, it’s incredible how far $20 can go. Living in coastal Northern California, we also notice the seasons change through the fishing seasons. Around here, “winter” is synonymous with “Dungeness season”—many families serve Dungeness crab feasts for the holidays, in place of the more traditional roast. “Spring” means “salmon season,” with fishing for Pacific-caught salmon opening on April 13th. This year, for the first time, George and I are trying our hand at ocean salmon fishing, hoping to stock our freezer full of salmon filets. George has long been a fly fisher, and in recent years I’ve joined him on fly fishing trips from California to Scotland. 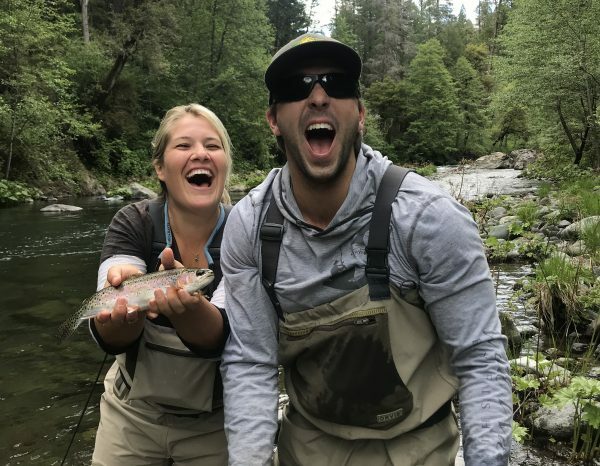 In fact, last May we were fly fishing on the McCloud River in Northern California (taking advantage of rainbow trout season!) the day we found out we were pregnant with our son, Mattis. This week’s “Table for Two” recipe is a culinary representation of spring here in Northern California. We might not be feeling the sunshine for the first time in four months like other parts of the country, but we are seeing the changing season on our dinner tables. 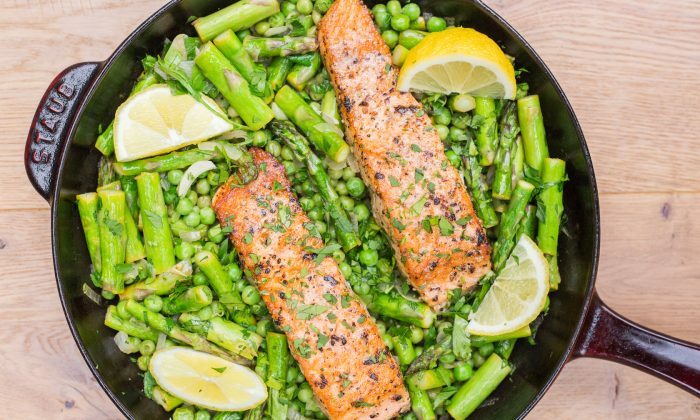 This one-skillet meal highlights wild-caught salmon along with my favorite spring vegetables: fresh peas and asparagus. For this recipe, you want to buy asparagus about the width of a pencil. If your stalks are fatter or skinnier, adjust the cooking time up or down. Minimal prep work is required and everything is cooked on the stovetop in under 15 minutes, making this an ideal weeknight dinner. To tackle this meal for two together, put one person in charge of cooking the salmon while the other chops the onion, garlic, asparagus, and parsley. The six minutes of cook time required for the salmon should be the perfect amount of time to prep the vegetables, but if you need a bit more, just turn the skillet off (so that you don’t burn the butter!) until you’re ready to resume the recipe. When we cook one-skillet meals, we like to bring the skillet right to the dinner table and serve ourselves straight from it. This recipe easily doubles; just cook in a 12-inch skillet. Whether you’re able to go outdoors without a jacket for the first time in months, or you too live in California and live a season-less lifestyle, bring the magic of springtime into your kitchen with this easy, nutritious recipe. Season salmon generously with salt and pepper and allow to come to room temperature for at least 10 minutes. Warm olive oil in a 10-inch skillet (preferably cast iron) over medium heat. Swirl skillet to coat in oil. Sear salmon flesh-side down for 3 minutes, until golden brown and crisp. Flip salmon. Add 1 tablespoon butter to the skillet and use a spoon to baste the salmon with the melted butter for an additional 3 minutes. Transfer salmon to a holding plate. Add remaining butter, shallot, and garlic to skillet and cook for 2 to 3 minutes, until shallot and garlic are softened. Add asparagus and cook for 4 minutes, until not quite crisp-tender (take a bite!). Add fresh or frozen peas and cook until bright green and tender, but not mushy, about 2 minutes. Stir in parsley and juice of 1 lemon. Season to taste with salt and pepper. Nestle salmon into the vegetables, skin-side down, for a few minutes to re-warm. Serve with lemon wedges. Caroline Chambers is a recipe developer, food writer, and author of “Just Married: A Cookbook for Newlyweds.” She currently lives in Carmel, California, with her husband George and baby boy, Mattis. Follow her on Instagram for cooking tips and snippets from her life in Northern California @carochambers.